It's Autumn. The mornings and evenings are cold out. Time for chicken soup. - mmm-yoso!!! It's Autumn. The mornings and evenings are cold out. Time for chicken soup. Happy Autumn 2008 to all of you mmm-yoso!!! readers. Today is Friday and it is time for another $5 for two meal, written by Cathy. Hi everyone. Boy have we had some cool evenings lately. It is soup weather. Coincidentally, chicken thighs and legs are on sale for 99¢ a pound at Vons this week, as is celery. You can buy carrots individually for less than a dollar a pound and can find some onions for that same price. This is all you really need. If you like, you could put some sort of starch in the soup, like noodles or rice or potatoes, but even that is not necessary. Chicken soup is *so* easy. 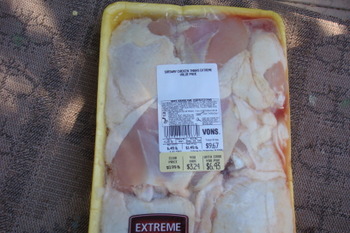 For the discount price, chicken is sold in this bulk package. I used 5 thighs in my 4 Quart stock pot and there were 15 thighs in this package. Thigh meat has more flavor than breast meat and there is only one bone to remove. I think thighs are easier to work with than legs. 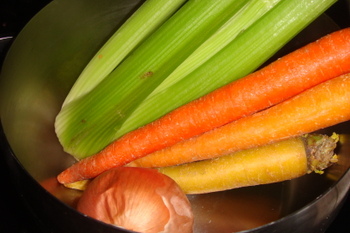 You will also need these three ingredients: celery, carrots and onion. The flavorful trinity known as a mirepoix. Chop these. Use the celery leaves. Put the chopped vegetables ( I used 5 carrots, 1.5 onions and the whole celery) and the chicken thighs, skin and all into the pot, fill with water, put on low heat and cover. Don't add salt or pepper-those can be added at the table. Oh. This is how you make stock, by the way. You don't have to cook this in broth or other canned flavorings. Simmer on low with the lid on for about an hour. Remove the thighs, let cool. 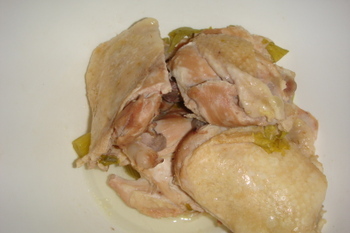 When cool, remove skin and bones and shred the chicken meat with your hands. You can skim fat off the top of the soup while these are cooling. 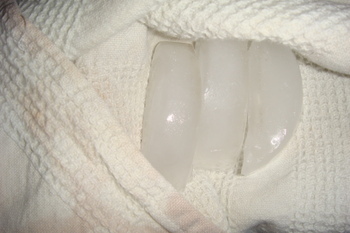 Put some ice cubes in a clean dish towel, twist and then run the towel over the top of the soup. A good amount of the fat will cling to the cold towel and even go through it and congeal on the ice. Another way is to put the whole pot in the fridge for about an hour and then skim the congealed fat off the top. Reheat the whole thing, ading back the chicken meat and some Herbes de Provence and/or garlic powder or other spices if you wish. At this point, just about 10 minutes before serving, you can toss in some rice or noodles or even potatoes. Alphabet pasta works well, too. Love the alphabet pasta! I will shop at Vons today for the ingredients, but I'll probably use a crockpot to make the soup. I never did it with turkey, Lori...but there will be turkey on sale soon enough. It is good as well as simple, Judy. Basic. If people only understood and did not try to overwhelm the palate, they could be so happy. Another great simple recipe. This is my style of cooking too. Thanks! Plus these days a $5 meal is a good thing. I have soup on the brain, too and was just digging through some soup recipes. 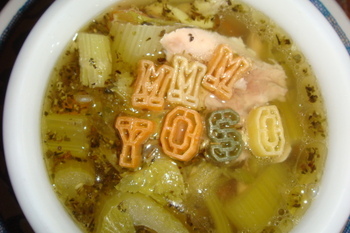 The alphabet pasta is so cute! 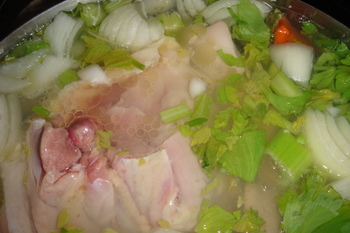 Your recipe is how I make my chicken stock/soup, too. Sometimes I'll add green onions (bruised), smashed garlic cloves, and ginger which is especially good for Asian dishes that call for stock. Well that's how I cook it. 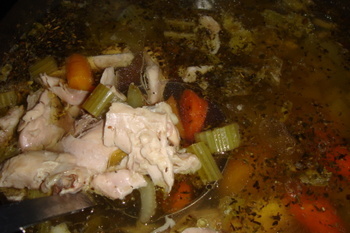 Thanks for the post Cathy, I love a good homemade Chicken soup. Depending on the chicken, I do get a lot of oil rendered out of it but I usually leave most in cause I like the lip smacking quality. Just a warning to some not to lift the chicken out with tongs with the cavity facing your hands.. The steam almost scalded my hands once and I almost dropped the chicken! That would've been a bad sight..
Bill- I love celery seed, as well as celery salt. The rosemary and thyme would definitely compliment a turkey soup...I can try it with chicken, definitely. Thanks for the safety hint, Dennis. I had a problem trying to lift out the thighs with chopsticks yesterday. I would imagine a hole chicken could be a mess... The ice removes some of the fat, not all of it. Cathy, looks positively delish. I'm wondering how you got the soup to be so clear. Everytime I do soup, its cloudy. I've seen methods where they do a first boil with the meat,and then pour it off to get rid of the blood flavor and then set a new pot and boil it the second time. Or am I thinking beef soup? Shoot I lift a whole chicken with chopsticks now that's scary!!! !I have other available tools to use yet I use chopsticks. I'm lazy to dig for the thongs I guess. Thanks, Sawyer. I got a little creative for a moment. If I let the pot rest then I can pull off the fat with a spoon once it cools. I just find it easier to do it this way if I am cooking and then eating right away. I used regular short chopsticks, (not the long frying ones)Bill. I have a few other tools in the kitchen also, but those regular ones are just always available...I have a few pairs in the cars and always carry them on the airplane. Can do, CP. But not today- it is supposed to hit 101°. wah, that pasta kills me! Looks rich and flavorful. I'm confused about the towel though, how do you clean that off? Doesn't it make yer laundry smell chickeny? It's an organic pasta from Trader Joe's (and product of Italy) and holds sauce quite well, FH. The towel ends up with a glob of chicken fat...and I do have dogs and cats who love me very much...I toss the dishrags and other whites in the hot water load of laundry. No smells.